You know, there are tons of games in which you try and survive in the apocalypse. Usually, you’re just an everyday person caught up in a bad situation trying to survive the end times. But in a few games, you get to play as the people who are actually behind the end times; I’m speaking of course about the Darksiders series. The Darksiders games have their own special little niche in gaming, I feel. Darksiders and its sequel were both well-received action-adventure titles with storylines that featured a unique take on Abrahamic theology. In each of the games, you’ve been able to play as one of the four Horsemen of the Biblical Apocalypse. Of course, the game always took some liberty with the source material, and it ended up being a bit of sci-fi mixed in with Biblical fanfiction. The third is back this time with the first female horseman (horseperson I guess? ), Fury. Fury lives up to her name, and she’s almost always in a bad temper. However, Fury doesn’t just show unbridled anger. Her vibe is more about contempt; Fury feels she is powerful and superior to all she meets, and she lacks the patience to deal with them. Of course, throughout the game, you get to see a bit of her soft side. Fury is sent to the planet, which is certainly not in great shape, and she’s told to seek out and destroy the Seven Deadly Sins. She does so at the Behest of The Council, a mysterious (and totes corrupt) group of beings that oversee the balance between the cosmic forces. Fury is accompanied by her trusty horse rampage and a slew of NPC’s and fun allies throughout her journey to slash everything that’s still alive down on earth. Now, Darksiders III is definitely keeping things a bit old-school in its gameplay. Hack and Slash action games were a dime a dozen in the PS3 days, and now many of the titles that emerged faded into obscurity (It was deserved in the case of Dante’s Inferno) or evolved into something different (God of War is one great example). Darksiders III is like a hack-and-slash title from the PS3 days…and it’s amazing for it. While the market became saturated, I don’t think the issue was ever the frenetic action gameplay. The idea was that the games became bland and uninspired in their combat and variety. But over the course of the series, the Darksiders games have managed to make you feel like a total badass while also making the world you’re up against tough as nails. Levels are varied and each has a particular theme with enemies and hazards that match that theme. You’ve got your flying enemies, insect times, brutish tank-like enemies, etc. It’s good because you never get too comfy fighting one type of foe. Darksiders III also manages to really push you to strategize in the gameplay. One fundamental way the game does this is through its boss battles. The Seven Deadly Sins are brilliantly designed, and each of the sins is truly the living embodiment of the sin they represent. The fights feel layered and engaging as well, and you find yourself really using the dodge and counter abilities a ton. However, the game starts feeling less impressive when you compare it to some other titles, namely the other two games in the series. See, Darksiders III has a ton going on. Its levels are big and expansive, and it takes on a sort of Metroidvania approach to gameplay as you frequently see barriers that quite obviously need you to use some sort of magical power you’ve not acquired yet. There are level up abilities and collectables that buff you up, and some pretty standard RPG-lite elements. But it’s a lot simpler than what we saw in Darksiders II, which for many people was the ideal sequel that built on Darksiders’ great premise. Darksiders II was a much bigger and more expansive title, and we don’t see that same sort of detailed level design here, nor do we get the same sense of scale. Additionally, the fact that most of Darksiders III takes place in the ruined earth means that while the levels are visually stunning in many cases and brilliant, they feel very familiar. Some of the series’ trademark weirdness comes out to play now and again, but you spend a shocking amount of time in broken down city streets that could be from the backdrop of virtually any action game. It feels like a crossover that shouldn’t have happened. But ultimately, Darksiders III provides something we haven’t seen in a while, and that’s an arcade-style hack and slash action game. I’m not even going to call it mindless fun, because it’s definitely a game that needs you to stay on your toes, especially on heavier difficulty settings. It also gets a ton of credit for running like an absolute dream on PC, which I would definitely argue is essential for an action game. Darksiders III definitely has an edge because it’s the only game out right now that sells you the ability to go into a spinning murder frenzy. 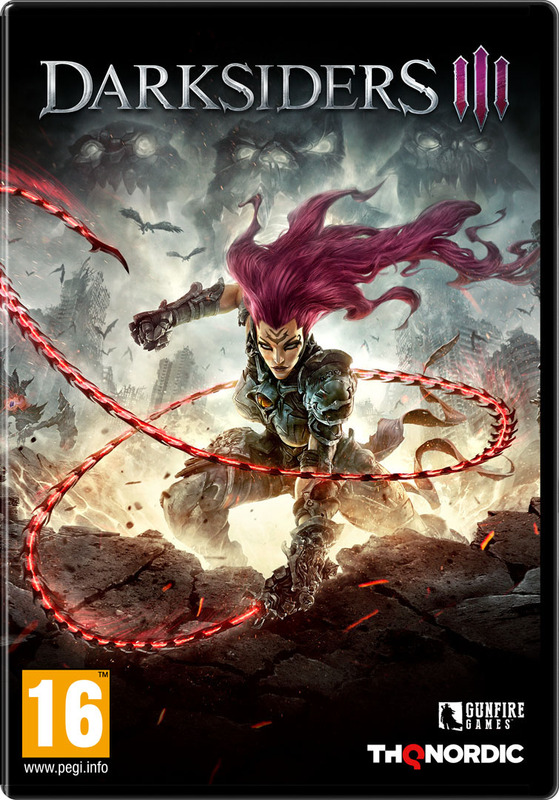 Darksiders III was reviewed using a PC downloadable code of the game provided by Versus Evil. The game was tested on a machine running Windows 10, with an 8GB NVIDIA Geforce GTX 1070 fitted on a 4th Generation Intel i7 4790 3.6Ghz CPU and topped with 16GB of RAM. We don’t discuss review scores with publishers or developers prior to the review being published (click here for more information about our review policy).